Richard Puddephatt was educated at University College in London, Eng. where he received his BSc in 1965 and PhD in 1968. He took a position as lecturer and then senior lecturer at the University of Liverpool before coming to Western in 1978. Author of 535 scientific journals, Puddephatt has received many awards locally, nationally and internationally. 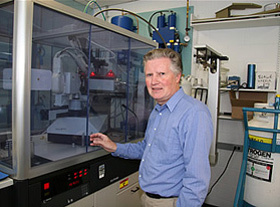 He is regarded as a world expert in platinum and gold chemistry. “He continues to be excited about chemistry and the possibilities that it still holds, thereby maintaining his strong reputation as a ‘jewel’ in his field,” says a nomination letter in support of Puddephatt. In fact, Puddephatt was the recipient of the Pleva Teaching Award in 2004. Puddephatt has been the designated leader of the Inorganic Chemists in his home department and has been a key participant during faculty recruitment initiatives and major equipment acquisitions. He is currently the Senior Editor of the Canadian Journal of Chemistry. Puddephatt says the award is a great honour.